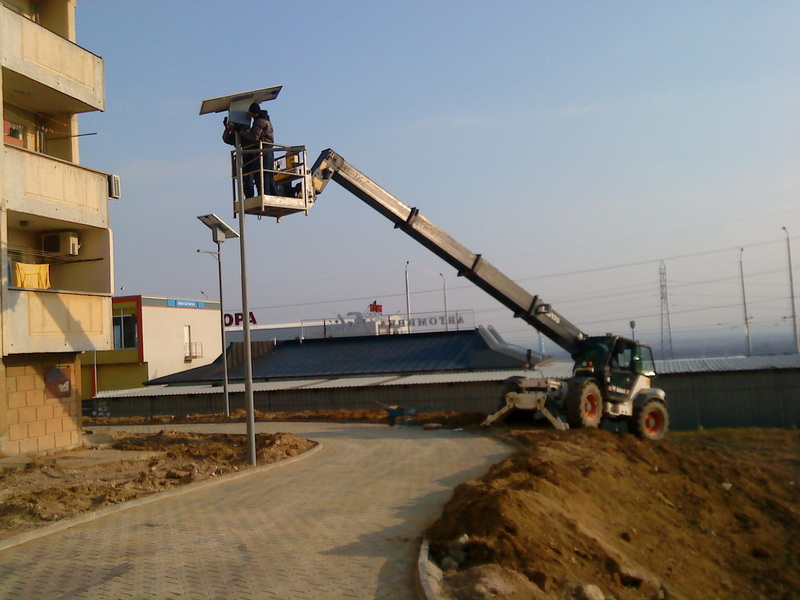 Photovoltaic ligthing in Stara Zagora. Welcome to the website of ELMI Ltd.
ELMI LTD was founded оn 29 September 1997 in Stara Zagora by a Regional Court verdict. The company is managed and represented by Eng. Anton Tonchev and Mr. Dimo Dimov. Company's main activities are construction, repairs and maintenance of electric power plants and networks; construction of wind farms and photovoltaic parks; infrastructure and utility construction; trade in a wide variety of electric, plumbing and sewage materials. Currently the company has over 90 specialists and engineers highly qualified and experienced in different fields of company activities. Its warehouse is located in Stara Zagora and occupies 37 000 square meters. Our knowledge and long-standing experience, our motor fleet and construction machinery, as well as the excellent feedback from our clients contribute for the company to be a preferable partner and a main contractor for construction works. Elmi LTD is certified under BDS EN ISO /IEC 17020 by the Executive Agency of the Bulgarian Certification Office and whereby it is authorized to exercise C-type control on electrical plants and equipment under and over 1000V. Certificate No 116 OKC/07.10.2003. The company is certified by Lloyd’s Register Quality Assurance Limited as meeting the requirements of: BS EN ISO 9001:2015 EN ISO 9001:2015 ISO 9001:2015 with Certificate № SOF0368250 of construction, repairs and maintenance of electrical power plants and networks; underground and overground installations to and over 20 kV; control of electric units and equipment under and over 1000V; and trade in electric materials. Validity of Certificate: 23 February 2017. The company is certified by Global Certification Services as meeting the requirements of ISO 14001:2015 and BS OHSAS 18001:2007. ELMI LTD is registered in the Bulgarian Central Professional Register of Developers for the execution of construction projects of Category one in Groups one, two, three, four and five. • Increasing of the market share and diversion of the company activities. • Increasing of the company competitiveness and efficiency. • Loyalty and honesty to our clients and partners.